Thursday 19th July - 2nd All day Singlehanded. It started out a balmy still day - just a very slight breeze form the NW. I was 4 miles west of W Culver Cardinal Buoy here - about four miles offshore. The weather started brewing here over Minehead - the tiny white mark on the left skyline is the holiday camp, North Hill central. Dead still here - ominously so. Within half an hour, after I had turned for home I was battling an squall/electrical storm for abour an hour. Not exactly what I had wanted - but was great experience. The seas cut up very quickly - so even when the wind died down again, the sea didn't. All good experience though - it was a difficult run back to Steep Holm, with steep seas coming in from the NW against the spring flood tide going NE, constantly trying to push the stern over. Got the knack in the end - it was difficult to stop her getting into an ever increasing roll. With just a reefed main and a bit of genoa - and little wnd really once it settled down again - I was making 6 to 7 kts with the tide. I turned at about 16.10 - just holding my ground until about 1700 - when the tide started to kick in Eastwards. Then I had the big squall - just west of W Culver sands. I was past the end of Brean Down by 1900 - which is about 12 miles in two hours. 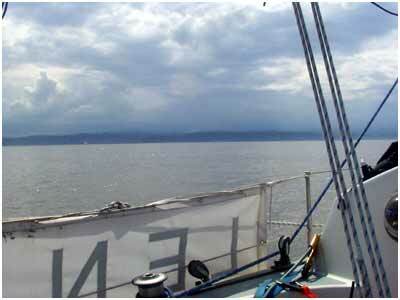 A really satisfying sail around Weston Bay - which was horribly grey, rainy, biggish sea going, getting dark. lights going on along the front - but after what I came through approaching Steep Holm - I was swanning around super confident, with just the reefed main, and it felt really sweet. Got her moored up on the river about 9 pm - after another very ungainly mooring charade - difficult when trying to get in early going with the stream. 32 miles - 8 hrs out, open water. See diary for more on this trip.